The Golden Dragon Museum is the first museum in Victoria to become accredited through the museum accreditation program in 1997. The Golden Dragon Museum provides a living history of The Chinese people of Bendigo from the goldrush of the 1850's to the present day. Central to the permanent display is Sun Loong, the longest imperial dragon in the world. The Museum also features one of the finest collections of Chinese processional regalia in the world, and several hundred Chinese coins, some dating back to 221 BC. Adults $7.00, Children (5-14yrs) $4.00, Families $20.00 (2 adults & 4 children), Concession $5.00, Children under 5yrs free. Wheelchair - strollers available, wheelchair access, guided tours, gift shop, toilets, restaurant, seminar - workshop facility, brochures in English, Japanese, Chinese , French, German, Dutch, library, cooking classes, language classes - mandarin, research, Tai Chi classes, education programs, restaurant, brochures in English, Japanese, Chinese, German, Dutch, library, cooking classes. Approximately 2000 photographs, including objects, embroidery and costumes. A unique living collection. 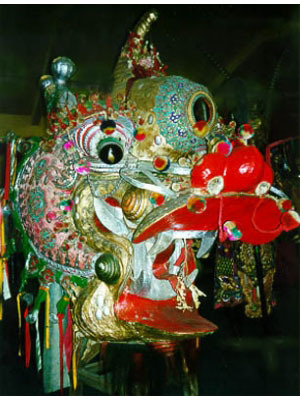 The largest collection of Chinese processional regalia, including seven Chinese dragons, costumes and banners. A selection of these cultural objects are used annually in Bendigo's Easter Parade, a local tradition to raise funds for charity since 1871.
in 2001 for Centenary of Federation. Cream silk rectangle in Darkwood frame. Reads "Presented to the Chinese residents of Sandhurst (Bendigo) by the Easter Fair Committee of 1879"
Horizontal Banner approx 3.5m long reads in Chinese characters "Presented to the Bendigo Masonic by the Chinese Association of Melbourne on the occasion of the opening of the Masonic Building. Large hand illuminated certificate presented to the Chinese residents of Bendigo and district by the Bendigo Easter Fair Committee 1919.